The University of New Brunswick recently welcomed award-winning author Naomi K. Lewis as writer-in-residence in the English department. Ms. Lewis is an editor, teacher and award-winning writer based in Calgary. Ms. Lewis wrote her 2008 novel Cricket in a Fist while she was a graduate student at UNB. 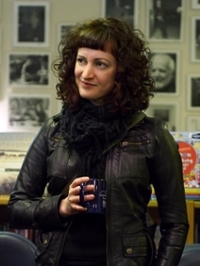 Her 2012 story collection won Enfield & Wizenty's Colophon Prize and was shortlisted for two Alberta book awards. Her non-fiction has been shortlisted for provincial and national magazine awards. Ms. Lewis spent the last decade as a magazine editor and will be UNB's writer-in-residence until April 2016. Writers-in-residence have an office in the department of English where they meet with students and community members to provide feedback and advice on their creative writing. Students and community members can send up to 15 pages of their own fiction or non-fiction creative writing samples to Ms. Lewis and can specify which kind of feedback they require. From there, writers looking for feedback can schedule a time to meet with her to discuss their work.